One of the things I remember the most clearly from when I was eight was when I was in the ICU. You’d think with all the medication I wouldn’t remember this very much, but I do. I remember having an oxygen tube and how weird it felt. I didn’t like it. Not one little bit. So I would grudgingly put it back in when they were looking. Then pull it out a few minutes later. I probably drove those poor nurses crazy, pulling my oxygen out of my nose every few minutes. But I didn’t understand what it was for back then. I could breathe just fine, or so I thought. I knew I was pretty weak and had just had major surgery, but my chest was rising and falling like it was supposed to. So I didn’t see why I needed a tube up my nose. What a contrast that is between then and now! Today Tim and I went to my Ear, Nose, and Throat specialist. These appointments are long due to wait times. Normally I bring my oxygen with me. This time, I didn’t. I was in a hurry on my way out the door. My hand had my phone and my kindle (priorities, you know) and the cart that I could carry the tank on was in the car already. The tank actually in my portable cart was empty from when we had gone to see The Dark Knight Rises the week before. We normally change it out the evening before my doctor’s appointments or as we’re loading it into the car the next day, but this time we forgot. The appointment itself took two hours. In the two hours we are moved around a lot. We go from the waiting room to talking to nurses to more waiting. Finally, we get to a room to see the doctor and then after all that’s over, we move to the procedure room where they clean my ears out. After that was a visit to Wal-Mart where we unfortunately had a lot to get on different sections of the store. Tim was left to do most of the work because I was already exhausted. I went to get the cat food because there were no little scooters to help me get around and it was the place I could get to the easiest. I got the cat food and sat down and waited for Tim in the pharmacy section because there were some benches. I had plenty of opportunity to people watch. Which as a writer is normally a favorite activity of mine when I’m out and about. Today, though, I was too tired to enjoy it. All I wanted was to go home and get back on my oxygen. I knew I would regret not bringing it and I did. When I got home, one of the first things I did was turn on my oxygen machine and put the tube in my nose. I’m still worn out from the day’s events. It was pretty long. But I sure am glad to have my oxygen back. Tonight I looked through some old pictures and found a bunch from the Make-A-Wish trip. It was interesting to look back on it all. I was so young then. I don’t remember a lot. I remember some things about the trip to Disney World. I don’t remember meeting any of the costumed characters I have photographs of. The things I remember the most clearly from Disney World are a ride called Body Wars because it grossed me out and a ride called Space Mountain because it scared me to death. Body Wars was one of those motion rides and it was about traveling through the human body. To someone who’d just been through major surgery and who had a fear of blood, this was really truly gross. I have motion sickness issues on top of that. I don’t think I got sick to the point of throwing up on that ride, but I sure was glad when it was over. By the way, the exit point of our “vehicle” was the heart. I still remember that. It was gross. I remember the line for Space Mountain and once we got inside it was totally dark. I didn’t really want to get on the ride. Roller coasters scared me. Especially ones that went upside down like at Six Flags. My favorite ride at Six Flags was the Runaway Mine Train. That was the only one at the park back at the time that was mild and not too fast. Mom and Dad told me that Space Mountain was just like Mine Train but in the dark. To make me feel better, my Daddy would sit with me in my car and hold me tight. I remember being really scared during the whole ride, but I felt better with Daddy there. And I didn’t get it on it again, either. Once was enough for me. I remember going to Universal Studios and getting to ride on this enormous bee. It was right after Honey, I Shrank the Kids came out to tell you how long ago it was and they were doing a special segment showing how they had made the scene where the kids fly on the bee. They asked for volunteers from the audience and Leah and I got picked. I remember realizing how many people were watching us and having stage fright. We put up the best performance we could (which wasn’t much to say the least and is a bit embarrassing to think about) but hey, we were kids. And it is a pretty nifty memory to have, even if a little on the embarrassing side. I also remember the place we stayed at. It had a bed that folded up into the wall like in the Jetsons. Leah and I thought that was so cool. I remember going to the pool to swim late at night because our parents believed in us being modest at the pool. That was the only time the pool wasn’t busy. I remember standing in line at Burger King and Dad being exasperated because we could have eaten wherever we wanted. We had our meals paid for during the week due to the Make-A-Wish people and all I wanted was to eat at Burger King. Poor Dad. I remember we went to Sea World and we got to see Shamoo. We even got stuffed toys that looked like him and I got a dolphin one, too. I don’t remember Sea World as much as Disney World, though. It’s funny looking back on it all. It seems like another lifetime ago. And in a way, it was. I’ve married since then. I’ve moved since then. I’ve even had another heart surgery since then. Pets aren’t the same, friends aren’t the same, and even family isn’t the same. I had some friends at the reunions that I met that I think about now and then. Part of me wonders if I should look them up on Facebook. Some part of me wants to know how they are. We had a lot of fun together. It would be nice to have fun together with them again. But part of me doesn’t want to know. A lot of children from Make-A-Wish lose their battles. I’m not sure if I’d want to know that my friends lost theirs. It would make me sad. So far I haven’t lost mine. I’m still fighting and God willing, I’ll be fighting for a long time to come. It has been several weeks since I posted the second part of finding out about Lauren’s serious heart defect. I guess I have been putting off writing about the first surgery because I am just not sure how much to tell or what to tell. I can tell you that ignorance is bliss and I am glad that I didn’t know everything that I know now. Prior to Lauren’s first surgery, they did a heart catheterization to determine just how much blood was flowing to her lungs and how her heart was functioning. I was not afraid during this procedure. I accepted it as a part of what needed to be done to help Lauren. That first catheterization was done on June 11, 1982. After the catheterization, we met with Dr. William Plauth, who, at that time, was the absolute best in his field. I am so thankful for him. He explained that he could not fix Lauren’s problem, but he could put in a shunt that went from her heart to her lungs, and that would allow her to live and grow until she was big enough to have a corrective procedure. I was not afraid of this surgery either. Again, I accepted it as a part of what had to be done. There was never a question about whether we would agree for Lauren to have the surgery. We had to. I think that it was the night before the first surgery when the nurses sat down with Tim and I to explain what would happen on the day of the surgery. Of course, there would be no food or drinks after midnight. Try telling a baby of 10 ½ months that they can’t have anything to eat or drink. That’s a challenge. Then, the nurse explained what would happen after the surgery and she told us that we would be able to see Lauren in the ICU about an hour after the surgery. There would be several tubes coming out of her to drain out fluids, she would have pacing wires attached inside her body to monitor her heart (but they pull these out later), and she would have a tube down her throat for the ventilator. She would have a midline incision and wires would hold her breastbone together until it grew back together. This process takes quite a long time, so the nurse showed us how we would have to pick up Lauren when we held her. We could never pick her up under her arms again. We would have to put one hand on her bottom and one hand on her back so that no pressure at all would ever be on the breastbone. I sat there and listened to everything that the nurse said and I understood every word. What I didn’t understand, however, was how I was going to feel when I got in that ICU and saw my sweet baby laying there. I don’t think they can ever prepare you for that. No matter how thorough they are in trying to prepare you, you will never be prepared to see what I saw and for that first time, ignorance truly was bliss. I was thinking the other day about the fact that Lauren’s birthday is coming up in a little over a week. I’ve already given her a birthday present. She had been hinting that she sure liked the lap desk that I use with my laptop computer. And when I say hinting, here’s what I mean. “Wow mom, I sure like that lap desk. It’s better than the one I have. It would make a nice birthday present mom, hint, hint.” And since I know that she is the Internet queen, naturally, I got it. So I wasn’t thinking about the need to shop for a present, I was just thinking about what “Happy Birthday” means and it occurred to me that Lauren has many happy birthdays, though they don’t necessarily coincide with her actual birth date. Happy, meaning joyful, and birthday, meaning the day of being born, Lauren has been born, as opposed to having died, five times so far and that definitely makes me happy. We tease her sometimes and tell her she’s like a cat with nine lives. No wonder she loves cats! By the way, she has four now and if she had a little bit bigger apartment, I’ll bet she’d have more. I don’t know how many people can say that they have been born five times. I hope it’s not a lot, because it’s been very hard as a parent to face the possible death of my child that many times. It never gets easier. In fact, I think it gets harder because even though I know that she is okay for now, in the back of my mind, I know that there will be another and that is scary. It’s not an “if” or a “maybe”, it’s a “when” and I don’t want to do it. I don’t want to have to face that again. But I will. Most little girls get a doll at some point in their lifetime. Most normally have more than one. Clara has four at least that she carries around the house whenever she’s at grandma and granddad’s for a visit. When I was there recently for a visit when our air conditioner broke, she took one of my squares I had made for my friend’s blanket and used it as a blanket for her baby doll. She covered her up and carried her to the kitchen. When I was a little girl, I was no exception to owning dolls. My sister and I had about fifty Barbie dolls between the two of us. But of all of my dolls, I had a really special one mom gave me when I was about a year old. There was nothing particularly special about the doll other than the fact that my mom gave it to me. She has a cloth body and plastic arms, legs, and head. This doll is very special because she has been my surgery buddy. She has been with me for almost all of my operations except for my hysterectomy and the only reason I didn’t bring her for that one was because I couldn’t find her at the time. Not long after my cousin Jayme Osburn was born, I decided to name her Jaime after my new baby cousin. 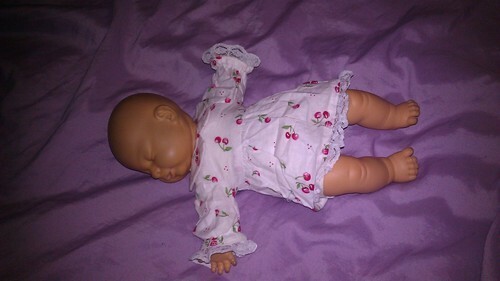 The doll was a baby, after all, and it made sense to me at the time to name her after the only baby I knew. I don’t think she ever had a name before that. If she did, I certainly don’t remember it. Back in 2007, I had a heart catheterization and I had Jaime with me like always. 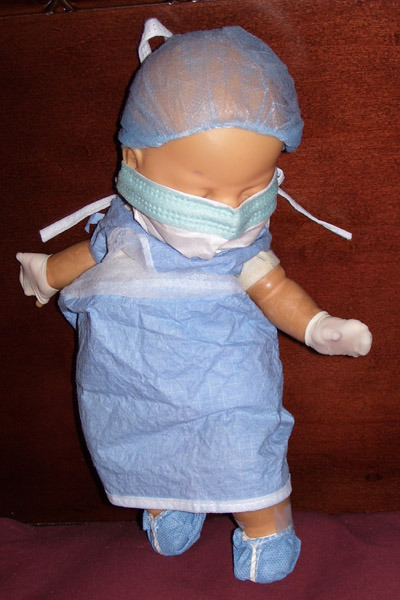 When I woke up from the operation, I found that someone had taken the time to dress the doll up for surgery. She was truly my surgery buddy. It was a very sweet, thoughtful gesture. I have no idea who was responsible for it, but it sure meant a lot to me. Sometimes small acts of kindness can mean a lot to those on the receiving end. To this day, I’m thankful for that bright spot in an otherwise very bad weekend that I spent in the hospital. To this day, I still have my surgery buddy. I have since had her restored as her cloth body was falling apart from the many years of use and I had a friend of mine, Laura Davies, who restored her made some beautiful clothes for her. I thought now might be a good time to explain how I got started writing. You all have Chad Landman to thank, (er blame), because he got me into Star Wars and that started my journey. How did it all happen? Well, pop some popcorn and get a drink because it’s quite a story. When I was a little girl, I hated Star Wars and wanted nothing to do with it. It wasn’t for my parents lack of trying to get me to watch it. But I just didn’t care about it. I always left the room whenever they started, “those war movies.” Once in awhile, curiosity got the better of me and I peeked in to see what they were watching. Inevitably, I’d always pick the bad parts to come in at. See, because I’d been in the hospital so much growing up, I can’t stand to watch any blood or gore on television or in movies. I just have a very limited tolerance for that sort of thing. To this day that’s still true and I almost always picked the bad parts to come in at. I usually picked when Obi-Wan sliced off the guy’s hand in the Mos Eisley cantina. One look at the guy’s severed, bleeding arm lying on the ground was enough to convince me to turn around and head out of the room again. Or even worse, when Luke’s arm was sliced off by Darth Vader. Or when Emperor Palpatine was electrocuting Luke Skywalker at the end of Return of the Jedi and Luke was screaming in pain. Yikes! I’d made the right choice to stay away from that! I was a very impressionable little kid and those sorts of things scared me a lot. What happened to change all of that? Well, a crush when I was 16. Fortunately for Chad and Bonnie and little Jacob, though, my crush faded over the years and went away. But that’s how it all began. I had the pangs of adolescence just like any other teenager. That part of me wasn’t deleted to say the least. It was around the time the Special Editions were coming out back in 1997. Chad got tickets to Return of the Jedi and asked Leah to go with him on a date. My sister was too young to date at the time, being only 14-years-old, so my parents asked me to chaperone. Great, just great. Now not only do I have to sit through these movies I don’t like, I have to chaperone a date with a crush to add insult to injury! I knew that Return of the Jedi was the last one in a trilogy but I didn’t know much else about the series. I dug through my parents’ video collection and pulled out A New Hope. It was a VHS copy and I trundled out a teeny tiny 13” screen and put it in. I was completely blown away by the storyline. She neglected to mention the key plot point of Luke Skywalker being the son of Darth Vader. Yeah, thanks mom. By the time the day of Chad and Leah’s date came around, I was actually excited to see the rest of the story on the big screen. I was hooked on it the minute the theme song blared through the theater and the bold yellow words scrolled across the screen. From that time period, I became obsessed with it. I wanted to find out anything and everything I could about it. At the end of my high school year, The Phantom Menace came out. In the months preceding the movie, I collected Pepsi cans (even though I didn’t drink Pepsi) and ate at Pizza Hut and Taco Bell to collect other stuff that was out. Instead of going to a graduation after party like a lot of other people in my class, I went to see Star Wars with my family. Jedi were even cooler than I thought! Sure Jar Jar Binks was annoying, but that was forgivable in my opinion. Lots of other girls I knew liked young Obi-Wan. I didn’t like Obi-Wan. I thought he was a brat who needed a lesson in respecting adults, but it was Qui-Gon Jinn who stole my heart. It wasn’t long after that that I discovered fan fiction and thought to try my own hand at writing some. Maybe, I thought, if I practice writing this way I will eventually be good enough to write professionally someday. Then, killing time at Calhoun between classes, I met Marian, another fan who was equally as obsessed with it as I was at the time. We started writing online over the AOL Instant Messenger and Yahoo Instant Messenger programs. We wrote some truly horrible and groan worthy stuff, but we were learning. Everyone has to start somewhere. Fortunately, many computer crashes later, those original pieces of ours no longer exist. Several years passed and I went to Freed. I wrote even more fan fiction when I was away from mom and dad and they couldn’t tell me to go to bed and turn off the computer. Headed to the library to study? Nope, I was writing fan fiction. I studied too, of course, but college and I didn’t get along very well. Each semester I would start out strong, and then get really sick and have to struggle to keep up. Routine illnesses for most people, aren’t routine for me. It takes me weeks to get over even small things like ear infections. The doctors and school nurse never really knew how to help me, either. To add insult to injury, I had asked for tutoring help and my tutors never showed up. So finally, I decided that college away from home wasn’t for me and took time off to get experience in the field of education that I’d been studying. I met Tim and we got married. I wrote more and more fan fiction and eventually learned how to create my own original characters in the Star Wars world. I posted a lot of it at www.theforce.net. (No, I am not telling you my screen name if you don’t know it, so don’t bother asking. :p) It was at this same message board that I met several Dear Friends, most of whom I am close with today, despite the fact that I don’t post there anymore. But I digress. In the hospital, they make you get up and walk to prove that you’re strong enough and healthy enough to go home. I hated walking laps. It’s not fun at all to try and walk around when you’re in pain and hurting. I remember my parents enticing me to walk after the surgery by telling me there was a computer in the playroom. Then I could get online and check my fan fiction to see if I had any replies and post. You know, I actually fell for that? I walked all the way around to get to the playroom to post a little note to my readers to tell them I was okay. Even more time passed. I never healed up from that surgery properly. We discovered that my left lung had been paralyzed during the operation. Most of the time, this problem corrects itself during the first two years post surgery. Unfortunately in my case, it didn’t correct itself. It stayed elevated and I was put on oxygen. Not long after that, I won disability. Eventually, after writing about Jedi for ten years, I was getting a bit bored. The prequels and the excitement surrounding new movies were over and I wanted something new. I also had more time to write now than ever, since I was at home on oxygen. But what to write about? I proposed to the question to Jackie, one of my Dear Friends. “Maybe you should try writing your own things now?” She suggested. Was she right? Was it time to write my own stories? Maybe, just maybe, now was the time. But again, what to write about? I liked the power that Jedi had. It was pretty awesome. What could I write that could wield the same power and might as the Jedi? Then it came to me. Dragons! I could write about dragons! Dragons have tons of power, way more than Jedi even! There are no limits with dragons, I thought. They don’t even have weird rules about not getting married! I could do all kinds of stuff! Sometime in there, I stumbled upon Holly Lisle’s website. Her website www.hollylisle.com has a lot of free advice for writers. I read almost every article she had posted. Then I forgot about it for a while and another Dear Friend pointed me back to her one day. I bought Holly Lisle’s Create-A-Plot Clinic and soon after that, I signed up for her How to Think Sideways course. I came up with the novel I am currently working on during her class and look where I am today? 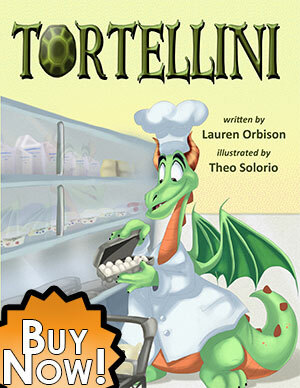 Now I’m writing and telling not just dragon stories, but my own story as well. You’ve no doubt heard the expression, “She’s got eyes in the back of her head.” This normally is applicable to mothers who seemingly have the uncanny ability to know what their children are up to even when the children in question are across the room or in another room altogether. My mother was no exception to this ability. In fact, my Mother Radar came with some pretty unique special features. She could predict the future! Or so it seemed. I remember at the end of my illustrious career in Middle School, we had to pick out our schedules for ninth grade. Our teachers and counselors gave us thick books with course subjects and descriptions of each. It was easily as thick as any college catalog. I remember thumbing through the various electives trying to decide what I should take and asked my Mom for her advice. “You should take keyboarding,” she said to me. I know I’m dating myself, but this was in the early days of Windows 95. We had a computer at home, but only Dad knew how to use it. We weren’t allowed to touch it without permission. I couldn’t see why I would need to learn how to use one of these clunky machines. I very grudgingly signed up for the course. Little did I know, mother was absolutely right. It’s funny to think back that there was ever a time that I didn’t know how to type. Looking at where things are now, it’s just astounding. I bank, blog, and shop online. I talk to friends in other countries online, take writing classes online, and I even met my husband online.